Vice President Joe Biden speaks to union members and supporters during the annual Allegheny County Labor Day Parade on Sept. 7, 2015 in Pittsburgh. Vice President Joe Biden is still undecided about the 2016 race, but as he's traveled across the country the past week on official business, there have been a number of moments when it sounded like he was already on the campaign trail. Here’s a look at eight times the VP looked and sounded like a presidential candidate -- from running a Labor Day parade route in Pittsburgh to touting his foreign policy experience in Florida. Vice President Joe Biden plays coy when he’s asked whether he’s running in 2016 -- something every eventual candidate does at some point. “I’m gonna run part of the parade!” Biden said in Pittsburgh on Monday when he was asked if he has the rationale to run for president. 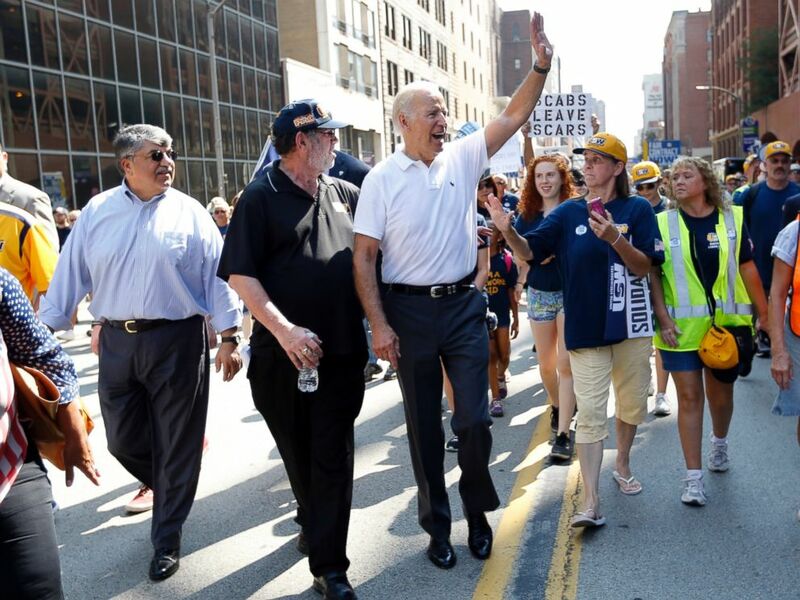 Vice President Joe Biden, center, walks with United Steelworkers President Leo Gerard, center left, and AFL-CIO President Rich Trumka, left, as he joins joins in the annual Labor Day parade on Sept. 7, 2015, in Pittsburgh. Biden slipped into candidate mode while speaking at the United Steelworkers Union Building on Monday, almost accidentally saying he was looking for votes. When voters ask whether he’s running, Biden says the decision’s up to his wife. “You’ve got to talk to my wife about that. I’ve got to talk to my wife about that,” he said smiling. 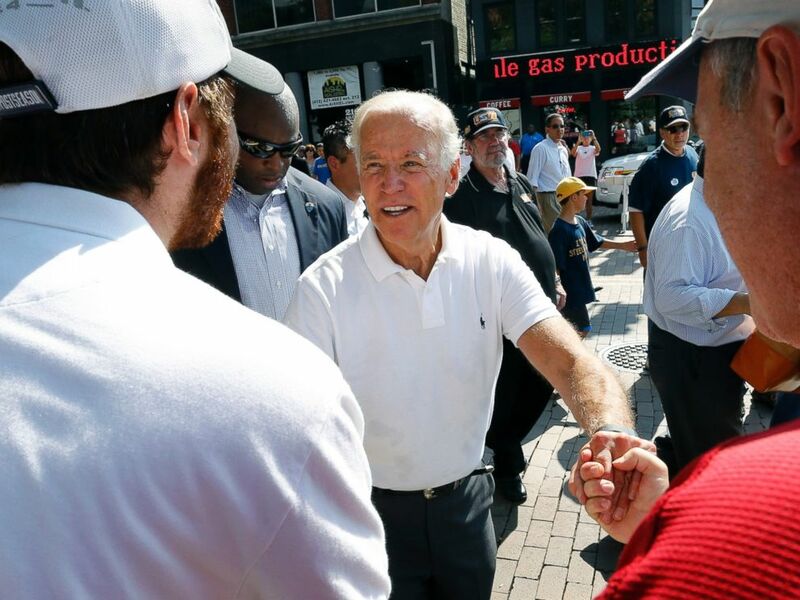 Biden was in full campaign (and Biden being Biden) mode Monday as he zig-zagged across the Labor Day parade route in Pittsburgh, schmoozing with babies and potential voters. Vice President Joe Biden, center, greets some of the crowd as he walks in the annual Labor Day parade on Sept. 7, 2015, in Pittsburgh. Some people broke into chants of “Run Joe Run” as he ran through the parade. Biden often touts his middle-class upbringing as evidence he’s committed to protecting the middle class -- like he did in two speeches in Pittsburgh on Monday. “You know in DC I’m known as middle-class Joe, and in DC they say it not as a compliment,” Biden said Monday. In Davie, Florida, last week, the VP described his vast foreign policy experience as he talked about the Iran nuclear deal. Biden acknowledged those who helped him in his early campaigns -- including a steel workers union. "The only reason I’m standing here is back in '72 when I was 29 year old kid ... I couldn’t get help anywhere. ... But I won, I won because of the steelworkers. We have an expression where I grew up, you go home with them that brung you to the dance,” he said. Biden has spent the majority of his life in Delaware, but he also recognizes the importance of his roots in Pennsylvania, a key battleground state in presidential elections. He often reminds people he was born and spent the first decade of his life in Scranton, Pennsylvania. “It’s home. It’s Pennsylvania,” the VP said along the parade route in Pittsburgh on Monday.